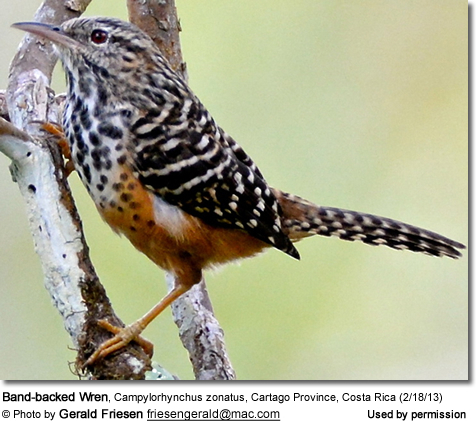 The Band-backed Wrens (Campylorhynchus zonatus) are small, resident (non-migratory) songbirds found in the Americas. They occur in central Mexico south to northwestern Ecuador in northwestern South America, where they occur in lowlands and foothills from sea level up to 1700 meters (~ 5 577 feet) above sea level. This species is most common on the Caribbean side of the central mountain ranges. They mostly inhabit thinned forest or open woodland, scrub, second growth and groves around urban developments. 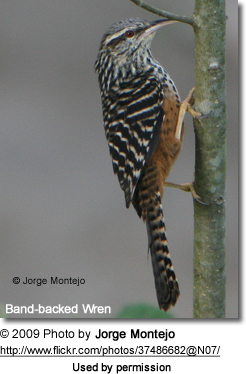 The upper plumage and the tail are heavily barred with black, tawny and white. It has a brownish-grey crown and black nape (back of the neck). The chest and throat are white, heavily spotted with black. The abdomen is cinnamon. Juveniles have a duller upper plumage and the plumage below is off-white to buff colored. The Band-backed Wrens build large spherical nests with a wide side entrance. The nests are placed 2 - 30 meters (6.5 - 98 feet) high in a tree or shrub, typically hidden amidst bromeliads. The average clutch consists of 3 - 5 unmarked or lightly brown-spotted white eggs. The female incubates them for about two weeks to hatching. The young fledge about 2 weeks later. Family groups use the nests for roosting in after the breeding season. The Band-backed Wren's calls are described as a short rasping zek call; and its song as a mix of dry chatters, splutters and gurgles. The Band-backed Wrens are often observed foraging in family groups of 4-12 birds. They mostly feed on insects, spiders and other invertebrates (= animals without internal skeleton, such as larvae, earthworms, millipedes, snails, spiders).